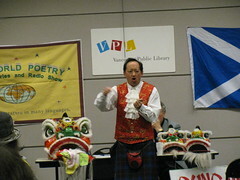 Gung Haggis Fat Choy, at the Vancouver Public Library. of Robbie Burns Day and Chinese New Year. 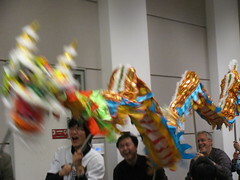 Expect bagpipes, a Chinese dragon, and verbal fireworks! This entry was posted in Asian Canadian Cultural Events, GHFC World Poetry Night, Literary Events, Main Page, Multicultural events, Robbie Burns Day, Robert Burns & Burns poetry, Scottish, Gaelic, Irish Celtic events and stories on January 21, 2011 by Todd. Jan 26/09–Gung Haggis Fat Choy at the VPL! 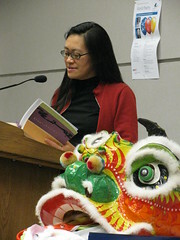 Every year we do a FREE poetry evening at the Vanocuver Public Library in partnership with World Poetry collective. Ariadne Sawyer and Alejandro Mujica-Olea are the wonderful organizers of World Poetry, which presents poetry readings at the Vancouver Public Library each month. 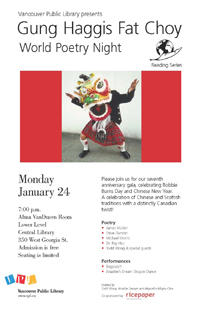 We bring together contemporary Scottish-Canadian and Chinese-Canadian poets, as well as reading Robbie Burns and presenting something very traditionally Chinese for Chinese New Year. Many years ago, I noticed that there wasn't a Robbie Burns poetry night at the Vancouver Public Library, so I called up Ariadne, and we created something special. from Scotland, China, and countries around the world. Hosts: Todd Wong (AKA Toddish McWong, right) and Diego Bastianutti. 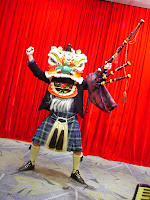 This entry was posted in Asian Canadian Cultural Events, Cultural Fusion, GHFC World Poetry Night, Literary Events, Main Page, Multicultural events, Music, Robert Burns & Burns poetry, Scottish, Gaelic, Irish Celtic events and stories, Upcoming Events on January 14, 2009 by Todd. Haggis Fat Choy creator Todd Wong? middle of the poetry readings. 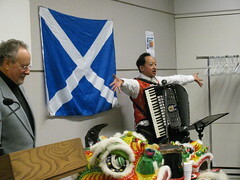 into an unofficial Gung Haggis Fat Choy festival of events. the evening's performers for our traditional piping in ceremony. will print it here later. focussed on an intercultural relationship. fitting a talk for Martin Luther King Day. New Year on February 18th, would be the Year of the Pig / Boar. money for the dragon to accept. hee hee…. with a Chinese theme of bamboo. performer. That was Gung Haggis Fat Choy World Poetry Night. This entry was posted in GHFC World Poetry Night, Main Page, Recent Reviews on January 16, 2007 by Todd. intersection is called Gung Haggis Fat Choy World Poetry Night. 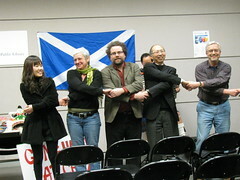 Club of Vancouver – photo Deb Martin. and the Asian Lunar New Year, also recognized Martin Luther King Jr.
elected a female president, to nice applause in the audience. year, and it was so well recieved it was requested for this year. Joe McDonald and Todd Wong, leading a singalong…. – photo Deb Martin. Sea.” Smiles rose on many faces as they all joined in for the chorus. Mozart's birtdahy. Rick Scott's most requested song is his “Yo! Mo! of Tanglewood Books, and hedraws on his Celtic heritage. Alexis Kienlen reading her poetry – Alejandro and Ariadne listen intently – photo Deb Martin. was inciteful and very much appreciated by the audience. everybody's faces, with our arms crossed together. Lam – photo Deb Martin. 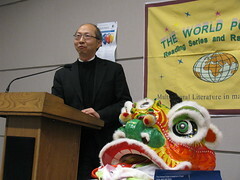 This entry was posted in Asian Canadian Cultural Events, GHFC World Poetry Night, Jan 16, 2006 GHFC World Poetry Night, Literary Events, Main Page, Multicultural events, Recent Reviews, Scottish, Gaelic, Irish Celtic events and stories on January 17, 2006 by Todd. Saturday afternoon in Kitsilano – Oh the people you meet! It's Saturday in Kitsilano – Oh the people you meet! Kitsilano is a great neighborhood. Filled with low income basement suites, students, expensive waterfront homes. attend. But Stephen Owen doesn't say no. might have to borrow a kilt because he doesn't own one. Hall. Hopefully we will see Shirley at Gung Haggis Fat Choy. This entry was posted in Jan 16, 2006 GHFC World Poetry Night, Literary Events, Multicultural events, Vancouver Area Adventures on January 15, 2006 by Todd. because we appreciate how hard you paddle. We appreciate how hard WE PADDLE…. 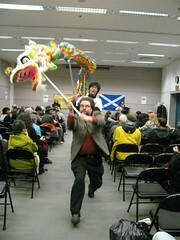 This entry was posted in Dragon Boat Information, Gung Haggis dragon boat team information, Jan 17 2005 Gung Haggis Fat Choy World Poetry Night, Main Page, SFU Gung Haggis Fat Choy "Canadian Games" on June 19, 2005 by Todd. Burns Day (January 25) and Chinese New Year (this year on February 9). including Scottish and Chinese pioneer descendents. for which he also played a chinese flute. different cultures each bring something to the mosaic of Canada. This entry was posted in Jan 17 2005 Gung Haggis Fat Choy World Poetry Night, Main Page on January 21, 2005 by Todd.